Courtesy of Oahu Luxury Homes LLC. Residing quietly behind gated walls, you will find Kumu Wai, your respite from the rest of the world. This U-shaped six bedroom, six bathroom villa sits oceanfront on Hawaii’s renowned Lanikai beach and wraps around a pool fed by a trickling pond. 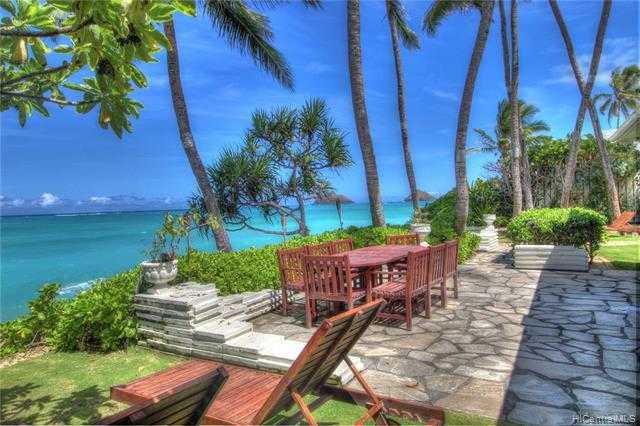 A gourmet kitchen, soaking tub in the master bedroom, decks, and Jacuzzi complete this estate.Former vacation rental with 18 years of good cash flow.D;A;D;A;Kumu Wai is also partitioned to accommodate large groups that want to be together, but not so close together. The main section of the home includes the living areas, kitchen, laundry facilities, a guest bedroom, a downstairs suite, and the upstairs master suite. The right wing with its own entrance is a suite. The left wing with its own entrance has two guest bedrooms and a shared bathroom. Please, send me more information on this property: MLS# 201824093 – $5,300,000 – 854 Mokulua Drive, Kailua, HI 96734. I would like to schedule a showing appointment for this property: MLS# 201824093 – $5,300,000 – 854 Mokulua Drive, Kailua, HI 96734.